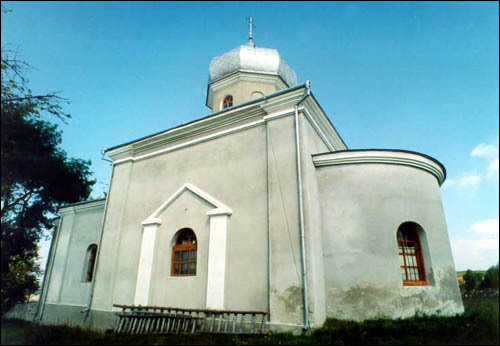 The village of Chernokozintzi, that is situated in 20 km from Kamjanetz, is know for its Roman Catholic past, five burial mounds, bounded to very old cultures and gypsum deposits and sulfuric springs. For the first time Chernokozintzi is mentioned in the XV century. 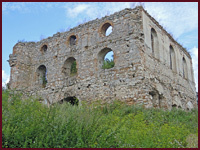 Since then till the XVIII century it has been in the ownership of Roman Catholic Bishops Cathedral, and there has been situated the residence of Kamjanetzs bishops. On the tower-hill, where later a castle was build for the defense of the town, there had been villages since late neolith. The archeologists have found there traces of Tripillian culture. On the request of one of the Kamjanetzs bishops, namely Vavrzhenza Mendgelevskogo, king Sigizmund the I gave to the city several privileges. Actually, the city was given privileges many times before because of the devastations, caused by the Tatar invasions in the years of 1502, 1503, 1507, 1511 and 1513. In the year of 1516 Chernokozintzi was completely burned down. 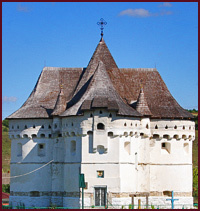 In 1538 Volosk master Peter laid siege on the city, and has conquered it, in contrast to the castle. According to his order, all the citizens were killed. In 1588 king Stephan Bathory gave the city the Magdebourg Right and other privileges. In 1674 he Turks had conquered and devastated the city, but after their reign, that lasted about 25-27 years, the bishops from Kamjanetz returned to the city and rebuilt it. 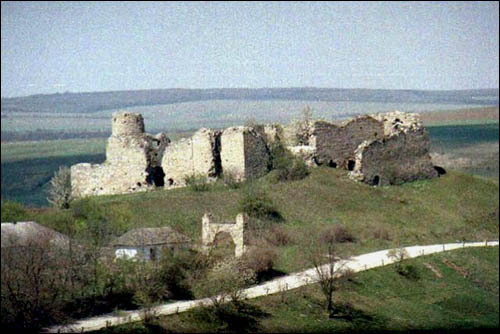 The exact date of the castle being build up is unknown, but as the village Chernokozintzi was situated on the Volosk way, it was built for defense from intruders. 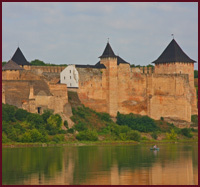 Perhaps, according to sir Przgezdetzkij, the Lithuania-Russian princes Koriatovitchs built the castle. The legend, which is given in the end of the story about the castle, tells the same thing. In 1538 Voloskiy master Peter, when laying siege on the city, could not conquer the castle, but according to his order all the citizens outside the castle were killed. In 1674 Turks conquered both the city and the castle, killing all the people. After the year of 1699 the polish owners have rebuilt the castle, and have widened its territory by building two additional two-storied buildings to the north wall. There was a palace-estate on the south-eastern side, surrounded with a fence. The estate was not preserved. Only the walls up to the second original floor are still to be seen. In 1795 the castle was carried over to the Russian Empire. In 1815 and till 1917 it was a private family residence of the Sarnetzkies. 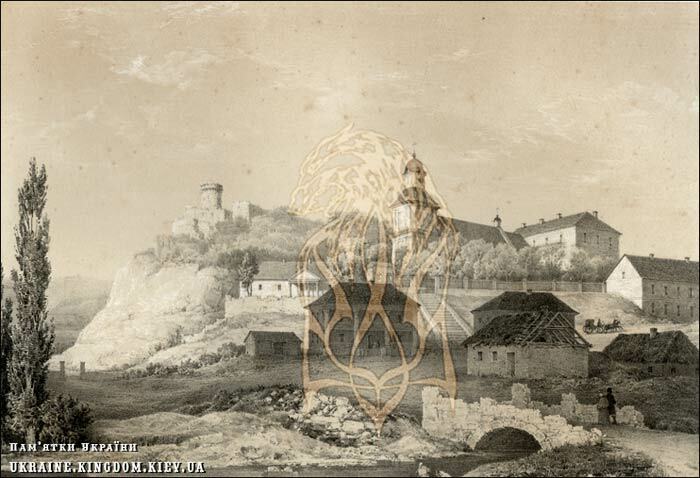 When staying in Kamjanka in 1831 the famous writer and specialist in folklore Volodymir Dal wrote down the legend about the castle. "People say prince Kurjatovitch used to live here with his young sister. The Tatars attacked the city and have conquered the castle. Prince could escape through an underground way and hid in the rocks of the river Zbrutch. His sister could escape from the Tatars over a natural bridge over Zbrutch and went to Galychyna. She has taken a lot of treasures from the castle and later on that money she has built a church with a cell not far from the river. Till the end of her life she prayed there for her missing brother." The gates of the castle were built in the XVIII century on the east side of the castle. They were about 5m high, and their base were two square pylons each 1,21 squared meters, with a distance between them about 4,7m. On the top they were decorated with artistic laying. The gates were plastered and surrounded by a stone fence. The western fence was about 5m long, the eastern – 2m, making an abutment. The ruins are to be found on the southern side of the tower-hill. 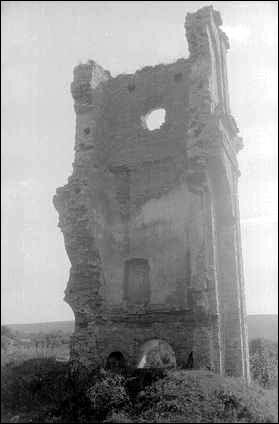 There has been a grand church, but now there is only the foundation and remains of the main front. The church was built in 1608 by one of the Kamjanetzs bishops namely Paul Valutzkij. His adopted son Jan Prohnitzkij has built there the Altar of Annunciation of the Blessed Virgin Mary. The repairs were made in the middle of the XVIII century, the ladder and the supporting walls were built at the same time. It is documented, that the parish was still functioning in 1772 and 1850. 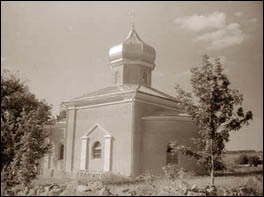 In 1894 the parish was closed, and in two years here was established an orthodox church. The first church was a three-storied wooden building, built in 1728. In 1822р the parish was closed, the church was demolished, and the new one-storied stone church was built on a new place in 1867. 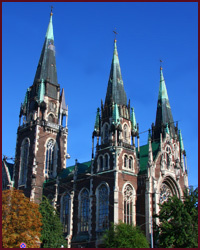 During the years of 1868 – 1877 the church was named after St. Nicholas. The maintenances were made in 1877. 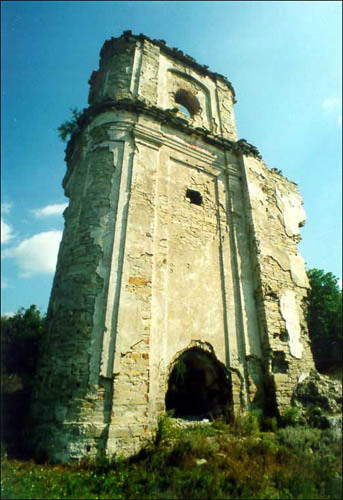 There has been another church in Chernokozintzi – the church of St. Michael, built in 1710, later reconstructed, and completely rebuilt in the years of 1780-1791 and demolished in 1867.